There’s a peacock that lives a short distance from us. 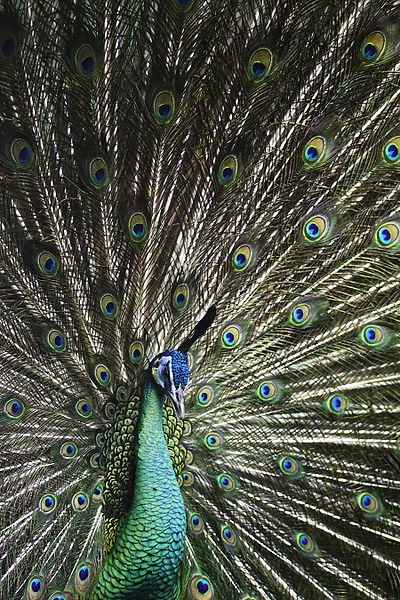 Sometimes I see him at the side of the road, showing off his splendid tail feathers. I suspect that he is an escapee from someone’s yard. He probably lives in the woods on either side of the road. These earrings are inspired by his beauty. The beautiful copper peacock feathers were made by my good friend, Kristi Bowman. I topped the feathers with gorgeous lampwork glass beads and little ceramic cubes. The finishing touch is a bit of teal silk, knotted between the lampwork and the peacock feathers. I chose the stunning colors of peacock feathers, blue, green and teal, to accent the copper feathers. I especially like how these earrings incorporate so many different materials: copper, lampwork glass, ceramic and fabric. You can find the Peacock Feather Earrings in my shop. This entry was posted in Jewelry and tagged Art Beads, Art jewelry, artisan earrings, feathers, Kristi Bowman Design, Linda Landig Jewelry, Peacock Feather Earrings. Peacock feathers by Linda Landig. Bookmark the permalink. I couldn’t resist. Those are so my color and I love peacocks.